How come Alex Smith is back to blowing hot and cold again? Smith has been programmed to live in fear of making mistakes. Even before the arrival of the current coaching staff, one of the knocks on him was that he had to see a receiver wide open in order to pull the trigger. That cautious approach was a big reason he threw only five interceptions last season in 18 games, including the playoffs. But it's also a reason the offense is susceptible to sputtering along at times. If Smith sees double coverage -- or just tight single coverage -- on anyone, he is going to look to go elsewhere with the football. That was part of Michael Crabtree's frustration after the 49ers' loss in the NFC championship game to the New York Giants. It's easy to fault the play-calling as vanilla, but you can be sure that few of those short throws that Smith made Thursday were No. 1 on the progression. I don't believe the coaching staff ties Smith's hands, as much as Smith chooses to be cautious based on his own decision-making after the snap of the ball. There is no reason the 49ers should not have been able to make some plays in the passing game with the amount of time the 49ers' offensive line supplied for Smith on Thursday. Smith was sacked twice for minus-2 yards, but the offensive line was not responsible for any sacks or quarterback hits, according to PFF. I understand that I'm probably going to open a can of worms on this subject, but I still want to talk about it. I'm happy about the win, but we're not going to beat many teams with 13 points. I do feel that Alex is really holding this offense back with his extremely careful play. Many can blame the play-calling all they want, but ultimately Alex decides where the ball goes, and unfortunately he won't throw it unless a guy is open for a least two seconds. He very rarely throws a WR open, which is why you're not going to see our guys have many spectacular catches. They simply don't have opportunities to. Many complained about our offensive line, we gave him an all pro line. Next was this targets, we gave him an assortment of weapons. Not sure what else we can give him, because clearly, he's not doing much with what he has. Will we get into the playoffs with Alex? Sure, but I'm not liking our chances at a Super Bowl with him at the helm. If things don't improve next week, Harbaugh has some thinking to do during the bye. I'm going to give him a pass if it is his finger affecting him but we will know a lot after Monday Night. He came off his most impressive game of the season against the Bills with two back to back duds. One thing that always ticks me off about Alex is he doesn't work the pocket but instead panics and takes a sack. Not every play is going to be perfect but the elite QBs know how to make something out of nothing. The OL played GREAT yesterday and neither of the sacks were on them as PFF stated. Also, Smith is one of the top 10 athletic QBs in the league but doesn't always use his legs to his advantage. Still, I BELIEVE IN ALEX SMITH!!!!!! I'd be willing to bet the offense is starting to get upset about Alex. I mean, Gore killed himself for that drive that Alex threw a pick. I saw Gore and Moss on the bench talking last night, wouldn't be surprised if they were talking about that play. Its gotta be a matter of time before guys start getting pissed off about this. If Smith doesn't do anything good in AZ will Kaep be our starter after the bye? That's an understatement. I fully expected them to struggle on three days rest and having to go up against this Seattle line. They were phenomenal and gave Alex the time he needed, but Alex did nothing with it. Alex waiting for someone to get open, then counting "one banana, two banana" before he throws it gets under my skin. Alex is going to need a complete collapse in Glendale. Who knows, many he was just getting his feelings hurt with all the time Kaep has been getting, which could explain his low confidence level. The one thing I give Alex a lot of credit is he reads the defenses pretty well pre-snap and audibles to a better play. This is usually for run plays but even Staley mentioned this after the game. I don't think Kaepernick is ready for all that but he is more of a big play type of QB. Give him another year and lets see what happens. Yep, a lot of games this season most of the sacks have been on him. Smith is a player that loses confidence in himself and holds him back. When he is playing free and using ALL HIS ADVANTAGES, Smith can help us get to the big game. They were talking about Gore's injury (back), but I know Randy was upset. You could see it on his face. We can say all we want, but the corners done a great job of jamming our WR's. There was really know where for Alex to go with the ball IMO. I do fault Alex for holding onto the ball too long though. He just needs to let it rip sometimes. Also, he needs to look to Moss as a first or second option. That is getting tiresome having him on the field and him not looking for him. We have it set up for Alex to succeed. He has the pass blocking OL, he has the QB guru as his HC, he's in the 2nd year of the system, he has weapons like Manningham, Moss, Davis, and Crabtree, and he has a running game that may be top 5 in the entire superbowl era. That's not including a defense that's #1 in PPG given up. He has everything around him, and he needs to start stepping his game up. Result of the play? Interception. Frank was pointing to Randy and he still missed how open he was. Pathetic. I don't know man, somethings gotta give. Alex is running out of excuses. He is what's holding this offense back. I really want to love the guy but he plays like crap most of the time. I'm tired of waiting for him. He has shown us all what he is. He's average at best. I don't care what his passer rating was it doesn't matter. Anyone can get those numbers when they play scared. Yeah that play was upsetting and could've cost us the game. Even before he broke out to the right side. 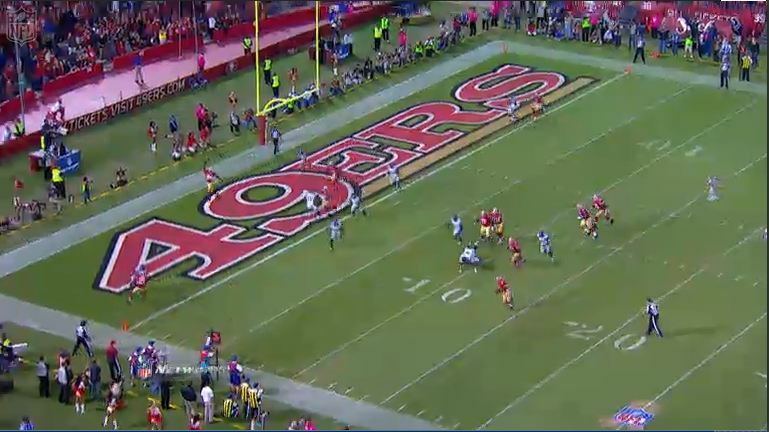 Alex still had a couple guys right in the middle that could've fought for the TD. IIRC. I think Alex knew he wasn't going to be able to make that pass to Randy. Whether it was because of his finger or his confidence is shot....or both. He's not very good throwing on the run and he's probably the slowest Quarterback on the run, as well. He never outruns defenders when he's scrambling. I see other quarterbacks make it to the sideline with room to spare all the time. I'm willing to give him a pass if there's something physically wrong with him, which I am leaning towards as the problem. I just don't understand why Harbaugh won't put in a backup QB, even if it's just a finger. Big Ben told his coach he was just fine and his coach let him play against us last year. How'd that work out? 3 turnovers and a walloping? Even the best quarterbacks out there are a liability if they're not healthy. Better to have a backup in, play vanilla offense, and let your defense win the game for you.